This book is very different from any I’ve made before. When I was a kid, I was fascinated by photographic picture books, but when I wrote the text for this book I didn’t imagine that it would be photographic because I thought that would be too difficult to do. I showed it to Miriam, the publisher at Scribble, and she immediately thought it should be illustrated using photographs, so that’s what we did! We worked with artist and designer Beci Orpin who designed and created all the backgrounds, and photographer Hilary Walker who took all the pictures. And of course there are the kids in the book! They all did a terrific job of making the shapes and experimenting what new shapes they could make as well. The idea for Watch This! came from seeing a photograph of kids making a square shape by lying on the ground. For a more detailed analysis of how the book came to be, read below! My daughter Lizzie (now 26) has always loved movement and gymnastics, from when she was a young child. In primary school she loved everything to do with circus, and she did sports acrobatics, which kind of both terrified and moved me! And of course I was very proud that this little ball of muscle who was my daughter could achieve amazing feats and seemed to have no fear of pushing her body physically. I think I found watching Lizzie do acrobatics emotional because I can never remember having such confidence in my own body. I was born with a structural problem in my back, so although I keep fit and manage fine, anything acrobatic or really physically risk-taking was never an option for me! As Lizzie got older she graduated into competition aerobics, and although the kind of sexualised costumes etc bothered me, I still saw that learning to have pride your body’s strength and what it could achieve, and trust in others to support you and your body (literally!) seemed instinctively like a positive thing for a teenage girl. The neat ending to all this would be that Lizzie joined Circus Oz or something but she didn’t! She became an interior designer! But she still enjoys keeping fit and really pushing her body to the limit sometimes. I think if kids can take pride in their own bodies and what they can achieve, then perhaps they are less likely to abuse or neglect their bodies as they get older. I’ve always been very drawn to colour - usually strong, bold, saturated colour. My favourite colour is red, and many early memories are visual and colour-filled. We have several synaethesics in our family, so I’m interested in the way children perceive colour and pattern. As an author I am often speaking in schools, and occasionally over the years I would see activities that kids did where they created shapes together with their bodies. I’m not sure if it’s a formal part of the Australian Curriculum, but I’d sometimes see kids lying on the gym floor making a square or a triangle etc, and I always thought it would be a fun idea for a book. But I wasn’t sure how it would be illustrated! I did think of photography, but from my anecdotal research (talking to various people! - not very scientific!) some people see photographic picture books as old-fashioned or perhaps a little forced or something. Even confronting in that the characters are unashamedly real people! Then I showed the manuscript to Miriam Rosenbloom at Scribe, and she immediately thought photographic was the way to go. Miri had recently re-published two photographic picture books (that were originally published in the late 1960s) and we both loved the idea of trying to make a photographic approach work. I had worked with Beci before and Miri and I knew that Beci, with her strong design sense and amazing ability with colour, would be perfect for the project. Beci and Miri both knew Hilary and how brilliant she is, so she was the obvious choice for photographer. Miri’s vision for the book was ‘Bauhaus meets Playschool’. I wanted the text to be made up of playful dialogue, almost as if we are eavesdropping on a group of kids playing. I imagine that the narrator is one of the children, and in earlier drafts of the manuscript there was a lot more dialogue between the children, but it was hard to make it all work visually. I had to change the text quite a bit as we were shooting the pics, as sometimes the kids either couldn’t or refused to do some of the things that were in the text! The photoshoots were really fun and pretty wild! Beci has already mentioned that the kids in the book are friends, relatives, friends of friends etc. (Marlo and Saskia are the grandchildren of a good friend of mine who’s also a children’s book publisher.) We have about one million fabulous out-take shots and we’re still trying to work out how to use them! My vision for the book was that it feel very playful – a celebration of movement, kinetic energy, pattern and colour. It’s about children using their bodies to make sense of shapes. To me, it’s not really a ‘first shapes’ book for a toddler, more for maybe a child at the age when he/she can recognise shapes, and might enjoy taking this further and exploring the fact that shapes are all around us. It’s about recognising shapes in more of an abstract context. 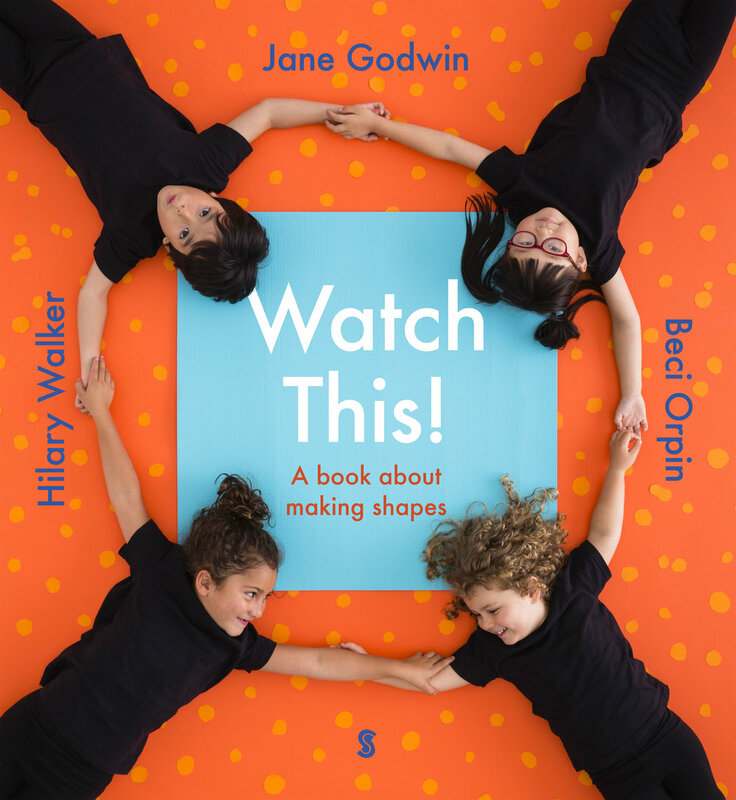 I don’t see this book as a cosy bedtime read, but more as a springboard for a whole lot of shape-related activities, perhaps to read in a kindergarten or early years of school setting. It could lead to exploring more ideas around kinesthetic intelligence, spatial and linguistic intelligence, and intra and interpersonal intelligence.